I laughed alot at American Dreamz. Maybe I am relaxing my standards, but I think most critics were a little too tough on this genial little film, penalizing director/writer Paul Weitz (American Pie) for not going far enough. I applaud him for even coming up with the idea of combining an American Idol-like talent show, the threat of terrorism, and the White House of George W. Bush into a comedy. 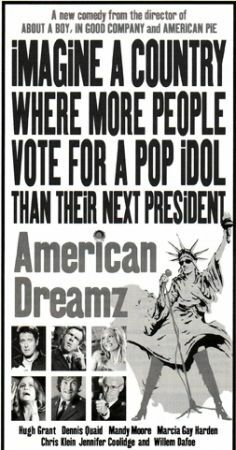 Briefly, the story centers around production of American Dreamz, the nation’s #1 TV show, and what happens when an Arab terrorist infiltrates as a contestant and the President of the U.S. appears as a guest judge to boost his plummeting popularity in the polls. 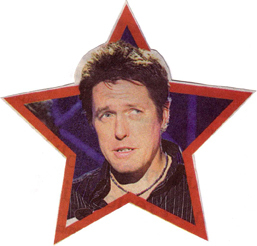 Mandy Moore as a wanna be Idol with a heart of brass and Hugh Grant as the swarmy Simon Cowellesque-impresario of the show – 2 utterly self involved people who briefly need each other – more than acquit themselves, and the rest of the players (including Dennis Quaid as the President, dumber than a board but with the stirrings of a conscience and William Dafoe as the Karl Rove power behind the throne) look like they are having such a good time, it’s infectious. For the film historians among you, compare this to Bye Bye Birdy, rather than The Americanization of Emily. Relax and enjoy it, then go home and read a newspaper like the President in the film does.